Bento for Kidlet: Doctor Who: Impossible Astronaut Day! Today has been declared Impossible Astronaut Day! Why you may ask? Well, because this is the day that the episode The Impossible Astronaut first aired! We're talking Doctor Who in case you haven't caught on yet. In celebration my Edible Geekery buddies and I are having a little Who Hop! Check out the next lunch by clicking the button at the bottom of this post! Now check out what my buddy Karen has going on at What's In Our Lunch Bags? 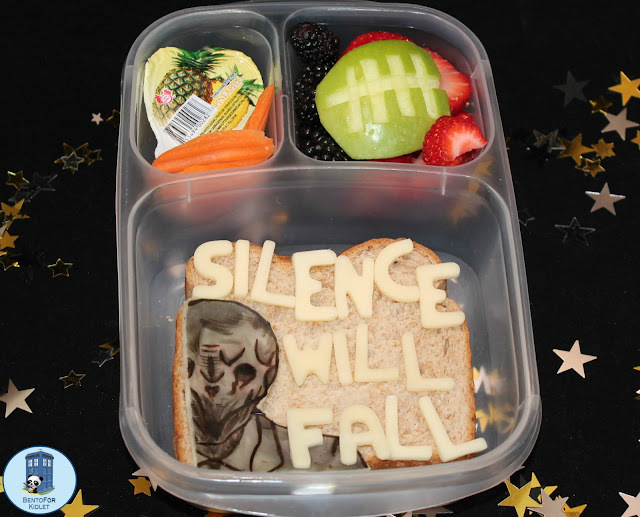 How awesome does the Silence look!!! You have achieved the impossible...creepy AND delicious! Love it!!! AHHHHHHH! I love your Silence!!! That silence is pretty epic. Nice job. Wow! Your cheese Silence is soooo creepy. Love it! That Silence is soooo perfect! Awesome! That Silence is AMAZING. Seriously, so well done! Very impressive cheese art work! I've never seen Dr. Who, but this is AMAZING. Holy Cow...that's all I can say!